Facebook rules our lives! And to power Facebook, you need to exactly know the best sizes that this social network accepts. Below, you’ll find the reasons why you should observe these sizes and also a one-page memo with all the information you need. It’s a matter of a visual perception in most cases. And Facebook has developed a dozen of features that help users get the sense of an account at first sight. 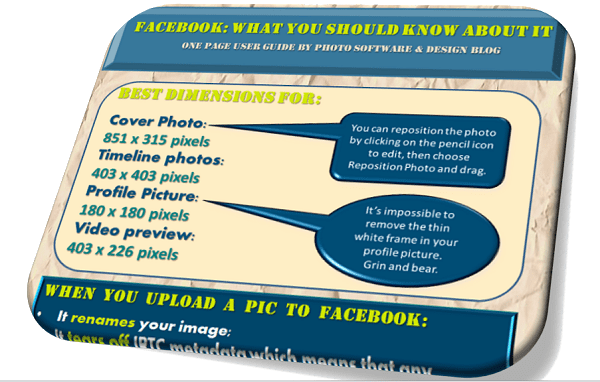 Cover Photo (851 x 315) – the best size for this item. Take a bigger and heavier image and Facebook will turn all your ideas upside down. The smallest possible size is 720 pixels wide. But the image quality will be not the best one. To fix the problem, you can try to resize the pic. Sure, you don’t want to boast a blurry picture on your page! And if you select a larger photo, you’ll be able to move and crop it to some extent. Timeline Photos (403 x 403) – it’s ok if you choose a bigger photo. But Facebook will automatically center the pic. So, if the objects in the image are not centered, they won’t be in focus and the whole impression will be spoiled. To solve the problem, click on the Pencil icon after you publish your picture, select the Reposition Photo and amend the positioning. Don’t forget to click the Save button after all manipulations. 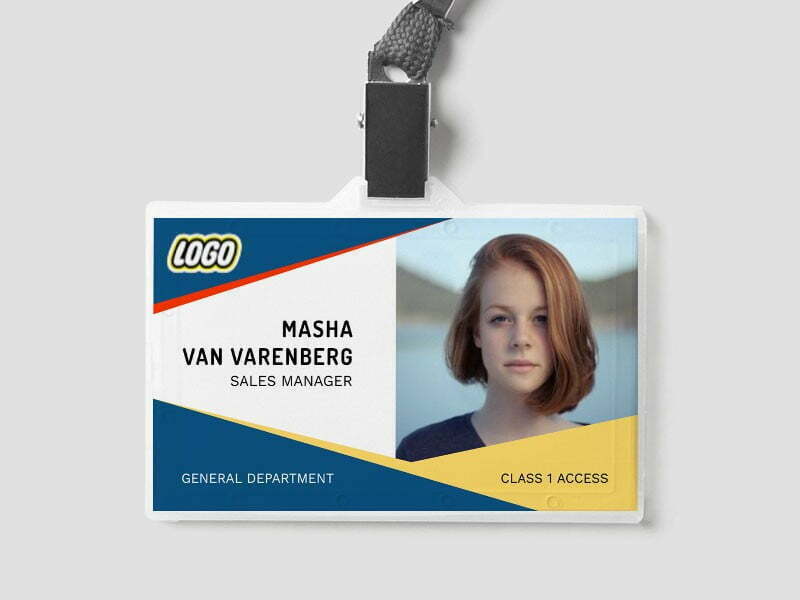 Profile Picture (180 x 180) – the official dimensions of your profile picture are 160 x 160 pixels. But remember that Facebook adds a thin white frame that cannot be removed. So, it’s better to take a slightly bigger pic to get a much better result at the end of your work. 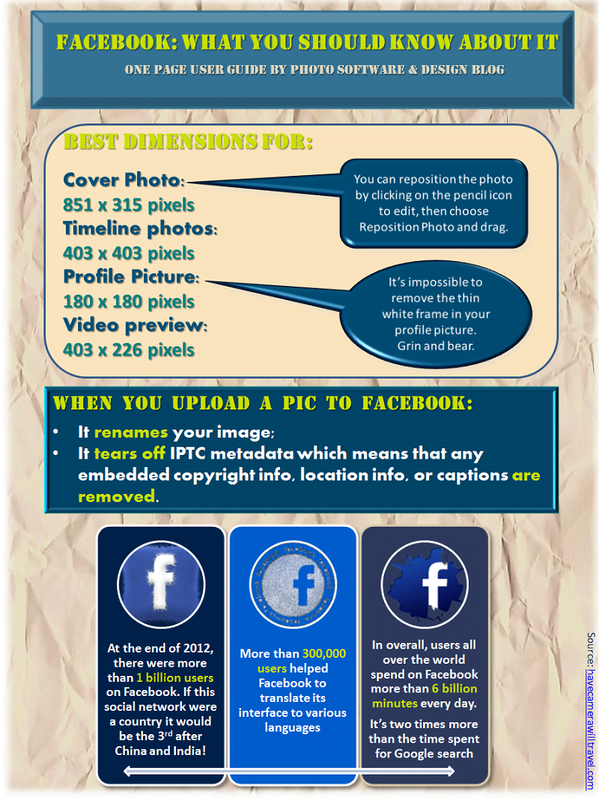 Remember about these facts and make a brilliantly looking Facebook page with many likes.